Combat Leader is a wargame designed and published by Minden Games. The scale is individual soldiers, which is pretty rare and a scale I love. It's had several expansions including a solo expansion rule set which works really well. So far the game is set on the East front WWII, though there is an expansion that covers the Winter War. I currently have all the expansions except the Volksturm one and the Winter War one. The game is highly recommended. 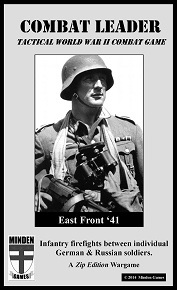 Art Bennett is the man behind this AAR, Tactical Wargames hope this isn't the last AAR we receive from him. Anyway, a big thank you Art! So click the AAR link below, I hope you enjoy it!